The west coast of Vancouver Island in British Columbia offers some of the best salmon and halibut sport fishing in the world. No Bananas Fishing Charters owner/operator Trevor Zboyovsky is a widely known and respected fisherman on Vancouver Island, with 25 years full time experience fishing the rugged west coast. We recently expanded to Oak Bay Marina for people looking to fish the Victoria area. Whether you want to target halibut or one of the species of salmon such as chinook, coho, pink, sockeye, or chum - No Bananas Charters knows when, where, and how to get your fish of a lifetime. next fishing adventure with No Bananas Charters. 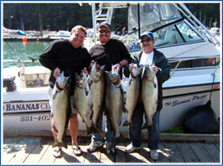 No Bananas Charters specializes in both salmon and halibut in the Victoria and Sooke areas. 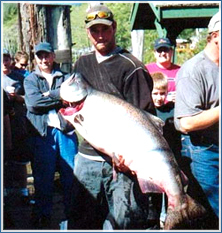 Our largest spring/chinook salmon ever brought aboard one of our boats was 62lbs - and we get our clients into many 30-50lb catches every year. 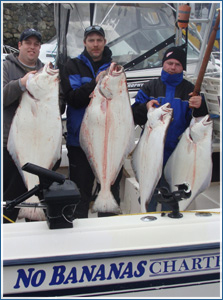 Our largest halibut was a whoping 267lbs and we catch many 100lbs+ each year. While we fish for any species you would like - No Bananas Charters specializes in big spring/king salmon and trophy halibut. Click here for some photos of past charters with No Bananas.